Pinaupong Manok simply means the chicken that sits. And that’s how simple it is to cook. Merely make the chicken sit on a deep bed of rock salt, cover and cook. 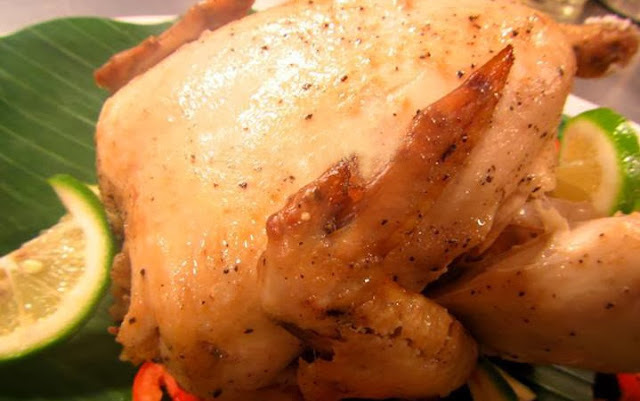 This is a classic Filipino dish with the whole roaster chicken and salt as the staple ingredients. You can make this stove-top with lemon-grass or even pandan. 1. Generously rub chicken with salt, garlic and freshly ground black pepper inside the cavity and outside. 2. Stuff the cavity with onions, lemon grass, garlic and ginger. 3. Place 3 cups of rock salt in the bottom of the palayok then line the top with banana leaves. Insert a can in the cavity of the chicken as a base so it won’t fall down and place chicken in a sitting position then place in an open flame over stove or fire burner, make sure the rest of the chicken would not touch the sides of the pot. Cook for 2 to 2 1/2 two hours or until chicken is tender. 4. Once cooked, place chicken in a wire rack to cool, let the juices run in a container. 5. Place all sauce ingredients together in a sauce pan and simmer in low heat for 5 minutes. 6. Place chicken in a serving plate then serve with gravy. Mouth-watering! Thanks for sharing. I also tried the essential oil of lemongrass by Gold In Grass. Just 2 drops. Fantastic!